Anyplace in my city, there are asphalt and concrete. It's hot in the spring. We see weeds and flowers in crevice of the pavement or stone wall. How strong they are! 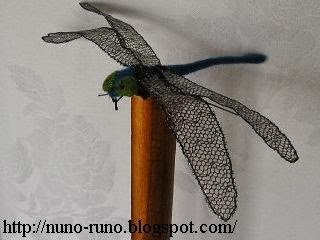 I have not seen dragonflies for years. 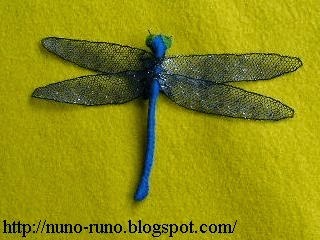 So made a dragonfly of cloth. Felt body and tulle wings. This tulle was also used as merman's tail. The rainy season comes soon. But recently we hardly see snails. The destruction of the environment drove away them. A snail of felt. 4 inches. Light blue shell and yellow body. Maybe you have mini tissue in your handbag. It is called pocket tissue in my country. Why not make covering case? Cut cloth and sew frill. Fold from both side and sew. Red one is made of Japanese chirimen paper. Today I made diet cookies of okara. Okara is dregs of tofu. You can buy okara at a tofu store. Brown sugar 15 g. Skim milk 10 g. An egg. Agar powder 3 g if you have. Microwave small chopped onion and sugar. Mix all materials and some water. Divide it 15 pieces. Bake them in an oven. 15 cookies have 400 kilocalories. If you eat only 5 cookies and water at supper, you will be slim. Maybe. But I'm very fond of pictures and reading about insects. I have a lot of books about insect. Recently I read the book about mystery of seventeen-year locust. It's full of mathematical interest. 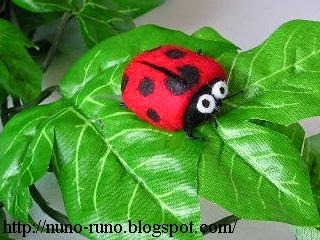 A big "seven spot ladybird beetle" of felt. One inch. The antennas and the legs are threads. This is my first Bunka doll. 58 cm tall. Bunka doll has an orthodox method of making. But I don't know it. So I made it in my original way. This is a fake Bunka. Bunka doll is a sort of Japanese doll. I heard that Bunka dolls are very popular in 1920 - 1960. 'Bunka' means 'culture'. I don't know the origin of the name. In that time, people must have admired foreign dolls and wanted to make European dolls by their own. Bunka dolls are never clad in kimono. Every doll puts on bonnet and one-piece dress. Funny face is like Betty Boop, isn't it? Now Bunka doll is also loved as retrospective item. Maybe you think they are cute.